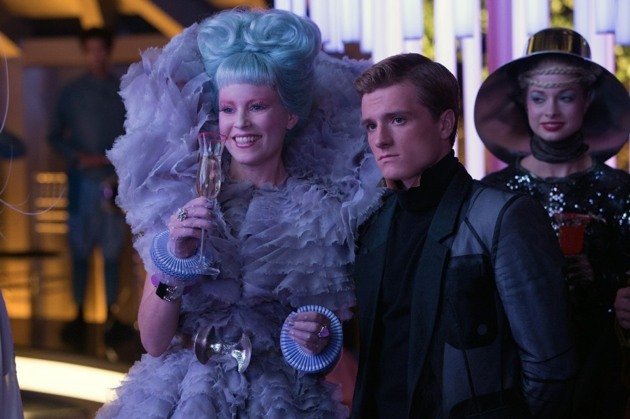 As we count down to Catching Fire, the film adaptation of Suzanne Collins’ Hunger Games sequel, we will get to see glimpses of the characters in great photos – and here is a new one. This photo appears to be during the games inauguration party in the Capitol at President Snow’s residence. Effie (Elizabeth Banks) and Peeta (Josh Hutcherson) may be watching Katniss (Jennifer Lawrence) and Plutarch Heavensbee (Philip Seymour Hoffman) sharing a dance. Yesterday we told you that Suzanne Collins has announced that she has plans to write a new YA series. We can only hope it will be as exciting as The Hunger Games trilogy! The Hunger Games: Catching Fire debuts in theaters on November 22. What do you think of the photo? I love Effie’s dress!